Cribbage, Monopoly, dominoes, poker… if you could dream up the perfect place to game, it would go like this: You’re seated on cushion-topped boulders of Sierra granite, a continuation of the hearth adjacent you—so close the fire’s warmth heats up the competition. Your family and friends are all within talking distance: one’s at the bar just steps away, pouring you a whiskey; one’s setting the dining room table, just over your shoulder; a few are in the kitchen where you can see them whisking, chopping; and kids are sprawled throughout, in front of the hearth and on the porch that wraps around the dining room and great room in which you sit. This is Valhalla, a Martis Camp home devised by Loverde Builders and Ward-Young Architects as a for-sale project, and now home to a family of six from the South. 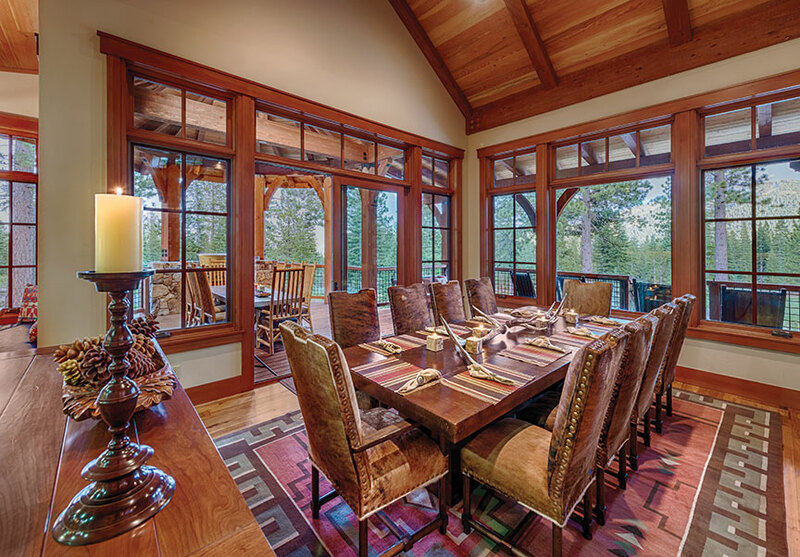 The great room impressed the Tahoe Quarterly judging panel, and it’s easy to see why: It’s a monumental 816 square foot space that manages to remain intimate. Guests are introduced to Valhalla’s great room by a porte cochere with a pyramidal roof, copper spire and carved dragon-head beams at each corner. The look is very much Wyntoon, William Randolph Hearst’s private estate on Northern California’s McCloud River, which was the leading design inspiration for this project. Described as Bavarian alpine architecture with craftsman detailing, the Wyntoon aesthetic (particularly that of the estate’s Tea House, designed by famed architect Julia Morgan) is a thread woven throughout. “The playful use of natural Sierra boulder masonry at the fireplace and game table expresses a similar vibe to the playful character of Wyntoon,” says Richard Loverde, general contractor, noting the fireplace’s sprawling design was conceived from a rock outcropping on the homesite. The long axis of the room points to the southeast, displaying views of Lookout Mountain and Martis Camp’s 7th fairway. High dormer windows illuminate the room’s upper volume, which crests at 24 feet. The ceiling of re-sawn Douglas fir is in a natural palette, accenting the steeply pitched hip roof. Ornamental timber trusses and custom-forged steel connections designed by Loverde Builders add to the inspired design. Surrounding this inviting, central space is the bar, wine cellar, kitchen and dining room, which are set off by their lower and distinct volumes. The outdoor covered dining area and barbecue can be seen through the dining room windows.